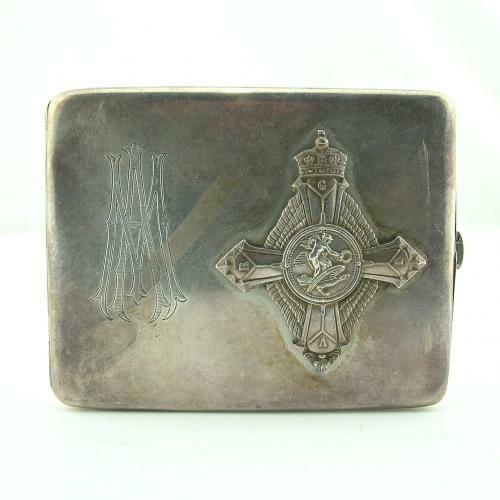 Cigarette case, white metal, approximately 10.5 x 8cm. Engraved with the initials 'A.M.' and with a George V period R.A.F. Air Force Cross carefully rivetted in place (top loop removed). This has clearly been attached for many years and is not a recent 'marriage'. The case appears to be made of silver or silver plate but in the absence of clear hallmarks we are selling as white metal. Brief research on A.F.C. recipients with the initials A.M. reveal only three or four but we have no provenence so cannot establish any direct link to anyone. The AFC was awarded for 'an act or acts of valour, courage or devotion to duty whilst flying, though not in active operations against the enemy'. Approximately 680 were awarded during WW1 and 2000 during WW2. An interesting item. Stock code M21XIX.